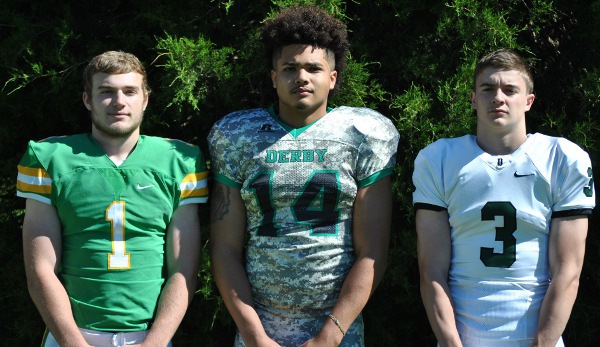 Defensively, Derby had plenty of offseason adjustments after the 2016 Class 6A title, its third in the last four falls. The Panthers had no coaching changes in the last four years. Then, defensive coordinator Cade Armstrong and defensive line coach Shelby Wehrman became head coaches at Andover and Cheney, respectively. The Panthers have faced a litany of defensive injuries this season. Derby returned just one defensive starter, senior linebacker Alex McGill, who suffered a season-ending knee injury on a non-contact play on a kickoff in the first week. The Panthers have lost six defensive starters to injury, along with sophomore quarterback Grant Adler. Junior Hunter Igo, the team leader, started the season at quarterback and then went to safety when the Panthers needed help. Adler took over under center before his year ended with a chest injury. Igo has returned to quarterback and has played safety in key spots. Brandon Clark, in his 12th year as head coach after two as a Panther high school assistant, said just one other season rivals this fall with the amount of injuries. Scheduling-wise, Derby took a 50-20 loss to Goddard in Week 2 and ended its 24-game winning streak. The Panthers, the fifth seed in 6A West, had to go on the road the last two weeks against the classification’s top-two scoring defenses. However, Derby has trumped the coaching changes and injuries with talent and Clark’s well-known family atmosphere. The last two weeks, the Panthers pulled off close wins at Manhattan (21-14) and No. 1-ranked Free State (55-49 in overtime). Derby has navigated 6A’s second-hardest schedule, according to Prep Power Index. This Friday, Derby (10-1) will travel to second-seeded Wichita Northwest (10-1) for the state semifinals. As of Tuesday, no players were declared out for Friday due to health, though Clark said multiple Panthers who played against Free State were questionable. Northwest, known for its speed and multiple weapons, is in the state semifinals for just the second time in school history. Derby advanced to the semifinals for the eighth time since ’08. One of Clark’s traditions that fosters the close-knit group is Thursday nights. Every Thursday, the team and coaching staff gathers to discuss life, have guest speakers, and write letters to those most important to them. Clark, a Valley Center graduate, has kept the letter he wrote his high school coach, Mike Smith, father of current VC coach Caleb Smith. Additionally, Clark, a former Kansas State player under coach Bill Snyder, has read multiple books by well-known leadership author Jon Gordon, including The Energy Bus, Servant Leadership and The Carpenter. “It starts when they are in elementary school and middle school, and I think that bond that they have – they are willing to do whatever it takes to show out on Friday night, and that’s kind of what they have done the last couple weeks,” Clark added. Former safeties coach Mitch Pontious has taken over as defensive coordinator. Clark called Pontious a father figure, great teacher and communicator. Linebacker coach Derek Goble and defensive line coach Zach Haynes are first-year assistants, while all other assistants have spent at least five years on staff. Derby started the year with a three-front base. At one time, the Panthers had its top-six linebackers out, so it had to change to a four-man front. After the Goddard loss, Derby went to a four-man look and played well in a 60-28 win against Maize, a top-5 Class 5A team that finished 9-2. Now, Derby has mixed up the defensive front looks as the fall progressed. The defensive line is very undersized. Senior Javon Davis has stepped up at cornerback, while junior safety Jackson Syring has a key interception against Manhattan. Igo’s older brother, Tanner, was a Derby star and plays for Friends University. Their mother, Melissa, is the president of the Derby High football parent group. Igo’s father and uncles were former Panther standouts. When the year started, Igo was Derby’s top quarterback. Once the injuries mounted, Derby called Igo on a Sunday and gave him a choice. Igo hadn’t taken a defensive rep since his freshman year. He moved to safety, a change that Clark said instantly made the unit better. Adler, the No. 2 quarterback, had competed well with Igo in the offseason in Derby’s run-heavy, spread offense that averages just 13 to 14 passes a game. The two split time the first two weeks. Adler took over under center in Week 3, though suffered his injury in Week 5 against Carroll. Against Free State, Igo had 28 carries for 167 yards and four scores and completed 8 of 14 passes for 150 yards and a TD. Standout senior running back Brody Kooser had 29 carries for 197 yards and two TDs last Friday. Other than a weather-shortened win against Salina Central, Derby has at least 197 rushing yards each game. Igo also played safety in overtime against Free State. On 4th-and-goal from the 3, Free State threw in Igo’s direction, and Igo covered the play well for an incompletion. Kooser scored on the next play for the win.